Preheat the oven to 325 degrees. Lightly butter a 10-inch cake pan and dust with flour. Pick through the pecans and pull out 8 perfect halves for garnish and set aside. Place the remaining pecans in a food processor and pulse multiple times until you have a mixture that looks just slightly coarser than flour. Set aside. Using a stand mixer or hand mixer, whip the eggs on medium-high speed until very light and fluffy, about 3 minutes. Continue to whip the eggs and add the sugar, about 2 tablespoons at a time, allowing it to become well incorporated after each addition. After several minutes the mixture should be very voluminous and pale. Add the vanilla and whip to combine. In a separate bowl, combine the flour, baking powder, and salt. Sift the dry mixture into the egg and sugar mixture and fold them gently together with a spatula, being careful not to over-mix. 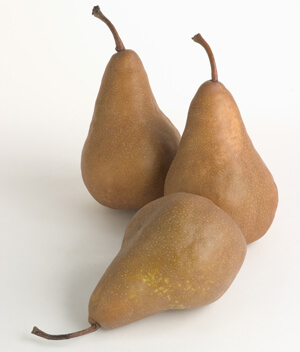 Next, chop the pears into a small dice—¼-inch or smaller. Add all of the chopped pears and the pecan meal to the batter, once again folding to combine without over-mixing. Pour the batter into the prepared pan, and bake for 40-45 minutes. When the torte is done, the edges will have pulled away from the pan. Cool the torte for at least 30 minutes before serving. Carefully turn the cake out of the pan and turn it right-side up again. 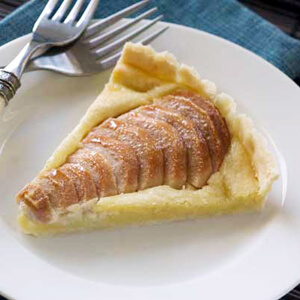 Slice into 8 or more pieces and serve with a large spoonful of whipped cream and a perfect pecan half. Store any extra torte in the refrigerator – it is just as delicious served cold.